Why Tucker Pup's Dog Boarding? Some places don't let you pick up your dog on certain days such as holidays or Sundays. This can be very inconvenient, cost you more money, and keep you away from your dog an extra night or two. Not only that, it begs the question as to whether they have enough staff present on those days to ensure the dogs are well cared for. We are open 365 days per year, with a full staff constantly present. You're at your brother's out-of-town wedding on a Sunday afternoon, when suddenly you remember that you need to get back to Chicago to pick up your dog from boarding. Other places make you get there in the early afternoon (including as early as 4 pm), or force you to be there between certain hours of the day. You would be forced to rush home and miss using all those techniques you learned in the "Wedding Crashers." At Tucker Pup's, when you're coming to pick up your dog (including on Saturdays and Sundays), you can come as early as 6:45 am, as late as 7 pm, and anywhere in between. Relax - stay and dance with the little kids in order to impress your new cousin-in-law. It'll be worth it. We're centrally located next to Downtown, and are right off the interstate. This makes it easy to drop off your dog on the way out of town, and pop over to pick him up when you arrive home. That makes one less hassle you need to worry about during your trip. We have full-time receptionists who answer most calls when you dial us. If you leave a voicemail, we call you back very promptly. In addition, you can easily reach us on Sundays, including with urgent requests. Unlike many other boarding businesses, dogs who stay with us have the option to be in group play during the day, including on weekends. This helps reduce stress, eliminates boredom, wears them out to help them sleep all night long, plus they have a great experience! 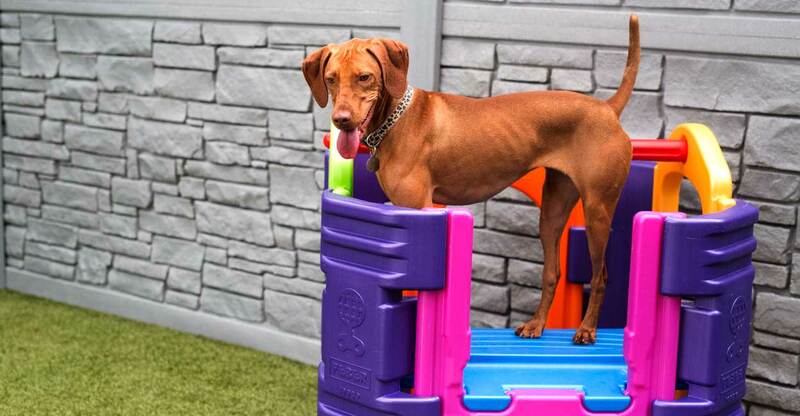 Unlike many facilities where dogs are in cages a lot then brought out intermittently, our boarding dogs have the option to be in play for up 12 hours per day with no cages. Of course, you can request extra nap time, which can be especially important for puppies and older dogs. Please note that we can only accept dogs for the Group Play option who won't bite or snarl at other dogs in the daycare environment. If you're not comfortable with your dog being in Group Play, we can still provide boarding services that include multiple instances throughout the day of one-on-one play and cuddle time, plus potty breaks. If you have chosen the Group Play option, rest assured that our playgroup setup is second to none. A lot of boarding businesses across the country won't let you bring your own food, and will only feed their own. This is not fun for anyone and will likely lead to an unhealthy situation, such as diarrhea, an upset stomach, weight loss, lethargy, and undue stress. When your dog stays with us, we strongly encourage you to bring your own food so he's as happy as a clam. Everyone enjoys sleeping in their own bed, and dogs are no exception. We want to make your dog feel at home, so when she stays with us, you can bring her bed, blanket, chews, and toys (as long as they are non-squeaky and non-destructible, such as a Kong). Have a puppy? You can even bring her crate if you want. Forgot your bed? We can add a blanket at no additional charge. These are benefits not allowed by a lot of other boarding places. If your dog already comes to Tucker Pup's for other services such as daycare, she will already be very comfortable in her surroundings and with our staff. That is very important to help relieve your dog's stress while you're out of town and will help her stay be far more enjoyable. New customers who want the Group Play option can schedule a free day of daycare with us prior to your boarding stay, so your dog can become familiar with our staff, our facility, and being around the other dogs. This is a significant benefit because your dog will be much more comfortable during her actual stay with us, and gives you the peace of mind about how she will do in your absence. This is much more desirable than arriving at 6 pm to a boarding facility right as you head out of town, dropping your dog into an unfamiliar kennel, and leaving for a week. Trust us on this one - it works really well. We play calming music in our boarding rooms at all times. This can help your dog feel relaxed, and it keeps them from hearing noises at night that might cause them to bark or not sleep as well. We have the highest staff-to-dog ratios in Chicago. This means multiple people are present in each play group at all times, which creates a safer and better experience for all the dogs in our care. We are very proud that all of our staff members are professional, know how to properly handle dogs, and are very passionate about them. Every job applicant must have prior professional experience in working with dogs in some capacity, so everyone here has either worked at a vet, another boarding/daycare facility, pet-sitting business, or rescue organization. If an issue arises, we'll call you and let you know, and we'll give you straight talk. You can rest assured that your furry friend is in good hands while in our care. Some dog businesses have you speak with a receptionist who doesn't know much about your dog's experience. At Tucker Pup's, if you call to check on your dog, and when you come to pick up, we will make every attempt to have you speak with someone who has actually been with your dog and can give you an honest and thorough assessment. This gives you a much better picture of how your dog is behaving and what can be done to further enhance his experience. Unlike the majority of boarding businesses across the country, we have a person who stays in the same building as the dogs all night long to provide security and peace of mind to you (and us!). If anything were to ever happen in the wee small hours of the morning, we can respond immediately and keep your dog safe and sound. It is rare that a dog leaves here from boarding with an injury or illness. However, the risk does exist, as it does any time a group of dogs gets together (including at the dog park). Tucker Pup's offers a unique solution, our Health Warranty Program. For a nominal $5 fee per boarding stay, we will reimburse you for up to $250 in veterinary bills should the need arise. It's that simple. Believe it or not, many dog businesses don't require proof of vaccinations, or they may ask for a document the first time but do not ask for it again once you keep going there over time. You shouldn't accept this, as it can put all the dogs at risk, especially if there are any contagious conditions going around in the dog community. No dog may be with the others if any required vaccination is more than a few days out of date. Our all-digital system automatically tracks all vaccination due dates and keeps computerized copies of any documents you send us. You can either bring in the document, fax it, or e-mail it. We will send you an e-mail confirmation once we receive any documents on your account. Our boarding suites are among the nicest you will see at any boarding facility. They feature glass fronts, which give the dogs a more pleasant and safer experience, and enable our staff to keep them as clean as possible. 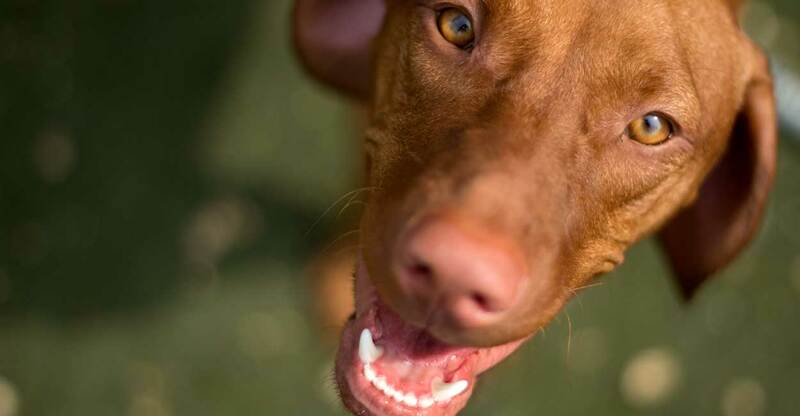 Tucker Pup's proudly boasts 2,000 square feet of canine grass in our outdoor play area. Many daycares don't have any outdoor space at all (or just a tiny area to go potty then come back in). If they do, it is more than likely on asphalt, gravel, concrete, or what used to be grass but is now just dirt. This means the dogs may come home smelly, dirty, matted, plus have a higher likelihood of getting sick. This is because these surfaces absorb pee and odor, can get very hot in the summer, and can easily create puddles which could lead to bacteria formation. The dogs' feet can also become tender or sore from a hard or gravel surface. Our canine grass is specifically made for dogs, as it is very cushiony and cool to the touch, plus has microbial blades that repel bacteria, an indestructible design so the dogs can't tear it up, a drainage system, and an air grid that keeps it properly ventilated and free of puddles. The dogs love it and they come home clean, happy and healthy after playing on it. Every inch of our play floors are made of seamless epoxy. This means that they are completely sealed and waterproof, ensuring that they are highly sanitary, clean, and odor-free. Many facilities have concrete floors, which absorb urine and emanate odors back into your dog's fur, and are difficult to keep clean and sanitary. Other facilities have rubber flooring, which has seams and becomes compromised over time, leading to unsanitary conditions. Some places have no natural light and can feel like your dog is in a dungeon. Not here. Tucker Pup's facility is loaded with windows that bring in lots of natural light, including in the daycare, boarding, and grooming rooms. This helps keep everyone in high spirits. Our entire boarding area is thoroughly cleaned and sanitized on a daily basis. Unlike typical boarding businesses that use bleach, we use industry-leading cleaning products that are highly effective at killing canine-specific germs and viruses. They are less harsh than bleach and won't cause your dog to come home smelling like a swimming pool. Tucker Pup's proudly offers Online Checkin, a unique option enabling you to speed up your checkin when you arrive. Simply click a link in your confirmation e-mail to launch the Online Checkin tool on our website, then enter all of the information that we need to know - trip and contact info, feeding, medicine, treats, naps, belongings, and more - in a highly structured set of forms. Therefore, when you enter our building with your dog, you'll already be checked in and ready to roll! This saves you time, helping you get to the airport or on the road faster. It also helps ensure total accuracy and preparedness on your end, and minimizes any chance of miscommunication about your instructions. Finally, it enables someone else, such as a friend or family member, to drop off your dog for you while still giving you the ability to answer the questions to the level that we need. Based on the convenience, ease of use, and benefits of this tool, you will soon discover that Online Checkin is the way to go! Our highly sophisticated computer system communicates and tracks a massive amount of details during your dog's stay, ensuring that everything goes smoothly and according to your instructions. For instance, every meal and delivery of medicine are logged every time in our color-coded tracking tool, so our staff can detect any issues immediately and take action accordingly. The system also communicates crucial information to our staff about your dog such as health issues, behavioral notes, and default instructions. As a result, all staff members are completely informed about your dog and can speak intelligently about your dog's stay if you call. It's so easy and convenient to make reservation requests through our website. Just fill in a few fields including your dates, and we will send you a confirmation e-mail in a timely manner. If we can't accommodate you, we will call right away. Click here to see our Customer Request tool. When you call us to make a reservation, or even change an existing one, we will immediately send you a confirmation e-mail to as many e-mail addresses as you want. This helps avoid any potential miscommunication about dates, plus includes a checklist of items for you to consider when preparing your dog for checkin. Our pricing is very straightforward, and we don't charge you a bunch of extras for things a boarding facility should be doing anyway. We accept all major credit cards (American Express, Discover, Visa, and Mastercard), plus debit cards, cash, and checks. We provide full grooming services seven days per week, including haircuts, deshedding, baths, nail clipping, and more. This means that your dog can be groomed to any level you want at the end of her boarding stay, and can either stay in the grooming room afterwards, or go back into play. This couldn't be any more convenient for you, and is an enormous benefit over dog businesses that don't provide professional grooming. Click here to learn more about our grooming services. We provide many leading brands in all-natural food and treats, toys and everyday supplies, at reasonable prices. This means that when you pick up your dog from boarding, you can stay well-stocked with the brands you love, without running all over town. This one-stop shopping convenience gives us a big advantage over dog businesses that offer little or no retail, carry brands that are not recommended, or have prices that are not competitive.